May is racing towards its unhappy conclusion. A happy conclusion if you’re looking forward to the Crick Boat Show, but an unhappy one if you are either Cynthia or I.
Monday 30th May is the final day of the Crick Boat Show, and Cynthia’s final day of her permitted stay in the UK. I’ll drive her to Rugby where she will catch a train to London and then on to Avignon in the south of France. Eighteen days later I’ll pack our possessions into the Hymer before climbing on board with basset Tasha and driving to Folkestone for a half hour £100 train ride under the channel to our rendezvous in Calais. From there we’ll drive through Belgium to Rotterdam to spend a day or two with Cynthia’s brother Jeff and his wife Judy and then on through Germany – did you know that Google doesn’t provide Street View images of Germany because of privacy issues? – before crossing the border into Denmark and on to the island of Aero where we will marry. Until then I need to knuckle down to earn some pennies to help pay for it all. I hoped that we would be able to spend most of our time cruising once we are married but, as is often the case, life has scuppered our plans. Even once we are married, Cynthia won’t be able to come back to England with me. She’ll have to return to New York so that she can apply for another ridiculously expensive visa, costing in excess of $4,000. The application process takes up to a month, so Cynthia is going to spend her time back in the USA tying up any loose ends which includes trying to sell her house. Once the visa has been granted, she will be able to return to me in the UK. Unfortunately we still won’t be able to cruise. Buying our motorhome and finding money for the wedding and its associated costs has stretched us financially. Calcutt Boats, supportive as ever, have agreed to have me back full time until the end of the hire boat and growing season at the end of October. Our plan at the moment is to stay on our marina mooring until after my November discovery days, then finally pack our bags before driving to Spain’s south coast for the winter. My time at Calcutt Boats is flying by. Each day is filled with variety. I spend my time moving boats, driving locally on errands and mowing, pruning and cutting. 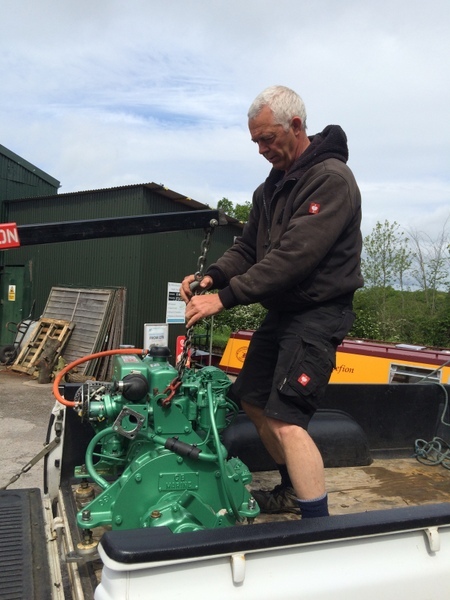 I had the pleasure of driving to Whitchurch on the Llangollen canal on Friday to deliver a reconditioned BMC engine. The motorway journey there took two and a half hours. The trip back in an attempt to avoid the usual M6 rush hour crawl through Birmingham on the way back took four hours. At least we were able to drive through pleasant countryside. 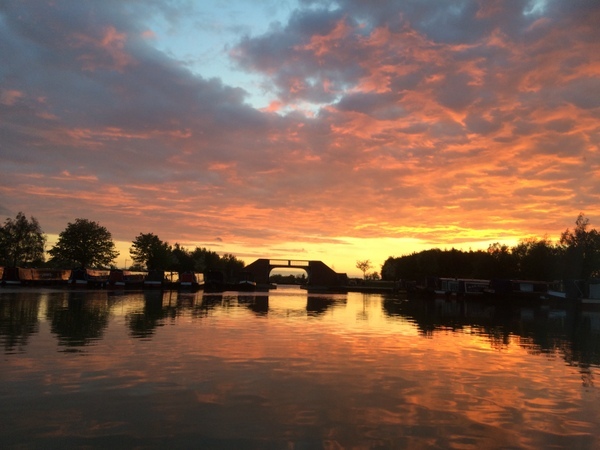 Are you going to the Crick Boat Show this year? It’s the busiest of the inland waterways boat shows and a wonderful day or two out if you’re interested in narrowboats. Cynthia and I will be there on Saturday where I usually collect a car load of things I want but don’t need. I’ll be watching my pennies this year though. I purchased a set of four braid on braid ropes last year. I was looking forward to using them on the boat. They are soft so they tie well, and they look good too. What I didn’t realise was that they are as absorbent as a sponge, so after anything other than a gentle shower they soak up pints of water. I managed to dispose of one of the four ropes by allowing it to fall off the roof and into the propeller. I spent an hour with my head down my weed hatch up to my shoulders in icy water trying to hack off a dozen turns of iron hard rope. I won’t be buying a replacement braid on braid rope at the show this year. I can’t think of anything I want this time, other than a pint or two of the dozens of real ale on offer at the beer tent. Sadly, there will be no beer for me either. I’m on a restrictive diet at the moment which means that I am denied anything with any taste, including my nightly red wine or beer. I am allowed gin and/or vodka, but both are a poor substitute for a real ale fan. So, if you are at the show on Saturday and you see a sad looking man wearing a ridiculous Crocodile Dundee hat, complete with crocodile teeth, looking longingly at the beer tent, please come and say hello. I will welcome any distraction to take my mind off the beer I can’t have. The weather’s picking up, more and more boat owners are brushing off a winter’s worth of cobwebs, and I’m just a week away from my June run of discovery days. I still have two dates available for exclusive singles and couples on 8th & 9th June. I’m offering a late booking 25% discount on both dates so you’ll save £62.25 on a couple’s day and £49.75 if you’re single and want to have both me and my boat to yourself for a ten hour journey of discovery through beautiful Warwickshire countryside. You can find out more about my discovery day service here. If you would like to book one of the two remaining dates click on the appropriate link below. Discovery Day for two people – Normal price £249 discounted to £186.75 with the code below. Discovery Day for an exclusive single – £199 discounted to £149.25 with the code below. Click on one of the links above to go to the appropriate calendar. Add your details to the calendar. You will receive an email directing you to the payment page. Enter the code below to receive your discount. Please note that the code is case sensitive, so type it exactly as it is written below. I hope to welcome you on board soon. After six years working at one of the inland waterway’s premiere marinas, I’ve met thousands of boat owners either passing through the Calcutt flight, stopping on the wharf for services, or mooring on one of the two hundred and fifty berths here. Many have been new boat owners trying to come to terms with a new boat, lifestyle, and mode of transport. I chat to many of them. The recent boat buyers often have tales to tell of mistakes made and lessons learned. Some have been very expensive lessons indeed. One couple, Phil and Alison, had a romantic dream. They decided to sell their London house to release enough equity to buy a modest second hand narrowboat and to fund their travel and living costs on a mid life gap year away from the stress of working and living in England’s capital. They imagined idyllic days together without a care in the world, sitting quietly on grassy towpaths next to their comfortable floating home, enjoying a glass or two of fragrant wine as they watched the world slip slowly by. They were both new to boating. They didn’t know the first thing about narrowboats, their design or onboard equipment. They didn’t care. They saw a reasonably priced and spacious boat and, after no research and ten minutes on board, handed £40,000 in cash to the broker. The boat, as is usual, didn’t come with any instructions. It also didn’t come with any fitted furniture. They had been seduced by the brochure’s “spacious boat perfect for living aboard” description. They arrived on the boat’s temporary mooring with a van loaded with their most cherished possessions and nowhere to put them. They exchanged a sizeable chunk of their summer cruising fund for a van load of IKEA furniture and then tried to shoehorn tables, chairs and beds designed for a house into their sloping walled tiny home. Once the first hurdle had been overcome after a fashion, they considered the logistics of handling their new boat. They eventually found a key to match the engine’s ignition, turned it on and…. Nothing! One of the brokerage office staff told them that the battery master switch was probably turned off. The information didn’t help them much. They didn’t know what a battery master switch was, or where to find it. They admitted that during their all-too-brief pre purchase inspection, they hadn’t asked to take the boat out for a test drive. They hadn’t even asked for the engine to be turned on. With a little help from a fellow boater, they located the two master switches, one for the engine’s starter battery, and one for the boat’s bank of four leisure batteries, turned on the engine master switch and tried to start the engine again. Two days later, with the help of an marine electrical engineer charging £37 an hour, they discovered that all five batteries were dead. The batteries cost £500 to replace and then Phil parted with another £1,000 to have an inverter, a battery charger, a battery monitor and some 240v sockets installed. The couple had spent £3,000 at this stage without moving the boat an inch from its mooring. Their next shock came when they moved their boat for the first time. The engine sounded fine when it ran out of gear, but as soon as they nervously took it for a spin around the marina, the rattling and squealing drove them to distraction. They discovered that there was an alignment problem with the drive shaft, something which would have been immediately apparent if they had taken the boat for a test drive before they purchased it. The remedial engine work cost them another £2,000. Then they spent yet another £2,000 having a cratch board and cover made and fitted so that they could store some of their less valuable possessions on a protected front deck. The repairs and improvements used all of their summer cruising savings. By now the couple were totally disenchanted with life afloat. By now they were more stressed than they had ever been living in London, and they were also without money or jobs. Their idyllic gap year was reduced to a frantic and very nervous cruise to a less than perfect mooring close to a place where they could both return to the daily grind. All of this could have been avoided if they did a little pre purchase research and had someone to turn to when they needed advice. Phil and Alison hadn’t had their boat surveyed before buying it. Fortunately the boat was structurally sound. Not everyone is quite so lucky. We had a boat here at Calcutt a few years ago. The boat was old and in a poor state of repair generally. The owner had sensibly organised an out of water survey before committing to the purchase. The survey results were alarming. The hull thickness in parts was down to 2mm, less than one tenth of an inch. This was an occasion when a survey highlighted a serious problem with a boat. Most potential buyers would either have walked away or negotiated a substantial reduction in price to pay for the hull to be over plated. The buyer of this boat did neither. After parting with far too much money for a boat on the verge of sinking, he sailed serenely off into the sunset. I didn’t hear any more about the boat, but with a hull as thin as it was and one which was in dire need of blacking, I doubt the tale had a happy ending. Yet another fairly frequent problem I’ve encountered is boat buyers who think that ex hire boats are a good choice for live aboard boaters. Hire boats are all beds and bathrooms. They’re designed to accommodate as many holiday hirers as possible for a week or two. They aren’t designed for one or two people to live on board full time. I know one local guy who purchased an ex hire boat to live on. His boat, typical of most hire boats, had gas central heating. Gas central heating is not only prohibitively expensive but boats with open gas fires like his are a condensation nightmare. He was paying £10 a day to heat his boat with warm but wet air. His heating was prohibitively expensive, but the design was more of a problem. His 60’ boat was designed to sleep eight people. He lived on board on his own, so he had seven beds too many, and nowhere to relax on cold winter days. He had to rip all of the beds out, remove one of the bathrooms, remove the coffin sized stainless steel pump out waste tank, and all of the woodwork surrounding the tank, remove the gas central heating system and install a solid fuel stove. When I last spoke to him, three years after moving on board, he still hadn’t completed the alterations. And because he was on a static mooring so that he could commute locally to work, he didn’t use his boat much for cruising. The larger open back deck, a common feature on hire boats, was a complete waste of space as far as he was concerned. He admitted that he’d made a very big mistake. 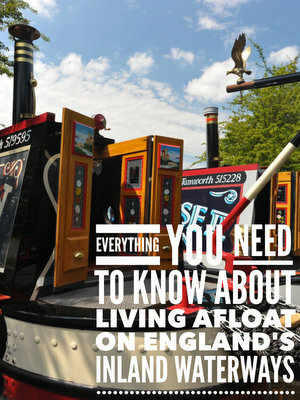 He should have chosen a traditional stern narrowboat which was already configured to suit his lifestyle. The examples I’ve included here are not rare. Potential boat buyers can find a wealth of information online on my own site and on dozens of other sites containing content written by experienced boaters. The problem many aspiring boaters face is that they have too much information to sift through. They could do with someone to hold their hand throughout the buying process. Someone to bounce ideas off. Someone to review potential boats for them and offer advice based on experience. A service like this isn’t currently available. I want you to tell me if you think there is a demand and, if there is, what you would like the service to include. Whether you are a current boat owner or you hope to buy one soon, please spare a few minutes to complete this very brief survey. There are only four questions. You’ll be able to answer them in a heartbeat and you’ll be helping aspiring boat owners to save both heartache and money. The survey is here. Thank you for reading this far. What started out as sort of a hum-drum week ended up Friday as a real winner. 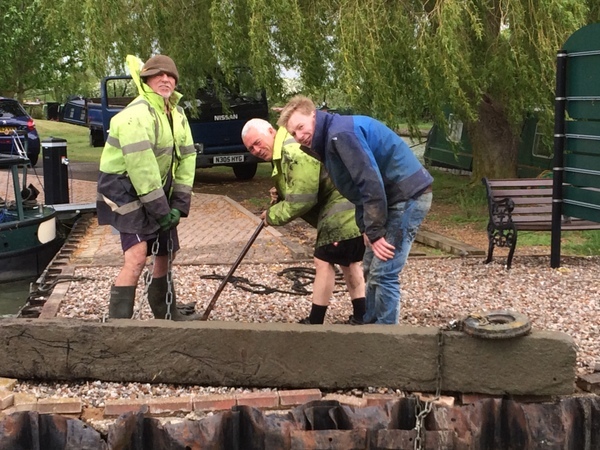 Thursday evening when Paul returned from yet another back-breaking day of strimming, dealing with derelict engines, and moving boats hither and yon, he had what turned out to be good news for us. He was scheduled on Friday morning to deliver an engine to a marina on the Llangollen canal in Whitchurch, just a stones throw from the Welsh border. We took to the motorways jammed with Friday traffic and made our way north. The last several miles of the trip there was on country roads that provided many delights for our eyes. After taking the photo of the sign, we sat for a few minutes to drink our Rooibos tea. I started looking at the map and came up with what looked like an interesting route back, traveling the road less travelled. What an afternoon that turned out to be! We discovered lovely little villages–one had the cutest, tiniest thatched roof timbered cottage I have ever seen–and through the most breathtaking valleys peppered with grazing sheep, meandering rivers and streams and woodlands that looked as if they had been landscaped. We even passed a couple of castles, and National Trust properties. Paul had never been to this region of the west part of the Midlands that bordered Wales, and neither had I. Every turn seemed to bring something glorious to behold. We promised ourselves we would return there in the motorhome to explore these trust properties and other delights. Even though it took us longer to make this return trip, we both agreed it had been worth it. However, the day for Paul did not end there. 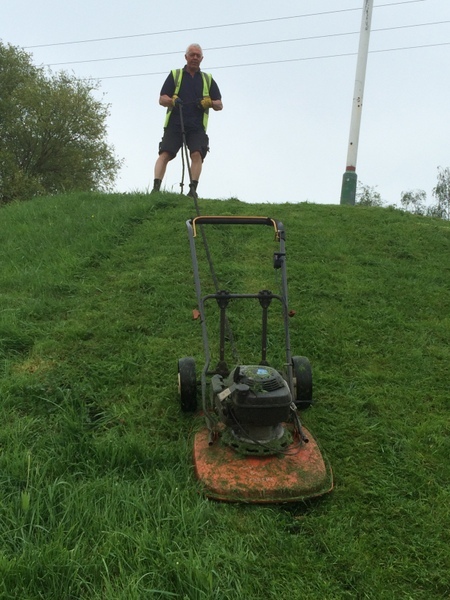 This time of year the lawns need to be mowed anew every week, so he was off to do some more strimming before he could call it a week. We both eagerly looked forward to our lie-in yesterday morning! I asked Paul during our trip north on Friday if he wanted me to continue my “Cynthia Says” during my stay in Provence, and he said yes. So, after next week you will be hearing my side of the story from across the channel. Before I draw this to a close, I want to say a BIG Thank You to the new subscribers to the newsletter. Once again, every subscription helps us to offset the high costs of keeping the website running. New things to look forward to as Paul comes up with more helpful ideas for those of you interested in this lovely life on the waterways. Have a great week!